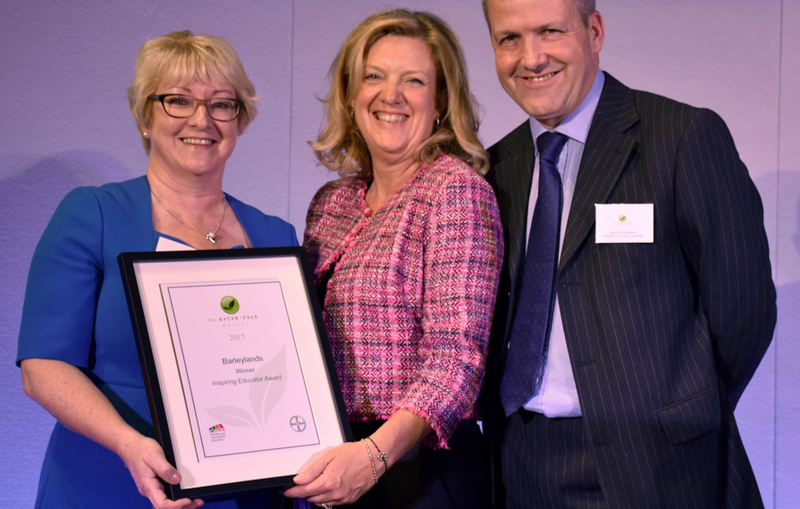 We’re delighted to announce that the Barleylands Farm has won the prestigious ‘Inspiring Educator’ award at the industry leading Bayer/FACE 2017 Awards. The ceremony was held on Wednesday 20th September in the splendid surroundings of London’s Banking Hall with over a hundred guests in attendance. The prestigious award celebrates farms and organisations that inspire new learning experiences which are seen as particularly innovative and effective both on-farm or back in the classroom. Karen Watson, Education Officer said ‘Winning this award is just fantastic, and really validates the work we do. We pride ourselves on not only teaching children how their food is produced, but encouraging them to explore how their choice of food has an impact on their health and on the planet, while learning important methods of past, present and future farming”. The education programme was started by the Philpot family over 30 years ago. Now headed by Chris Philpot the team encourage children to get hands on with a number of activities including cooking from scratch with produce they have seen growing on the farm and planting in the purpose built Polytunnel. Last year over 16,000 children took part in the programme, with schools visiting from South East England and from the heart of London. Michael Muncey, Head of Business for Bayer Crop Science in the UK, which helped organise the competition, said: “Barleylands is a very worthy winner of this award. It is fantastic to see the sheer enthusiasm of people trying to reconnect young people with where their food comes from, and we believe it is worth celebrating their achievements”. The team work hand in hand with teachers to provide bespoke themed days that link to the national curriculum. Recent themed days were Field to Fork, Local History, Kitchen Science and Stone Age Farming and many more. If you would like to book your school an educational trip, click here.